The most effective is not so strong as quick strike. This is not surprising, because the enemy simply does not have time to prepare for it. But because the development speed of impact is one of the main directions in the preparation of any fighter. Daily work with a hard wrist bands. The best is a simple elastic rubber ball. Constantly with the power of his squeeze, as if trying to crush. Try to keep the movement was sharp. Do the exercise both hands alternately. So you pump the interdigital muscles that will make your fist heavier and the strike sharp. Plyometric exercises are necessary to speed development. The most simple of them is push-UPS with cotton. Press your fists into the floor and take the position of "an emphasis lying". Slowly bend arms and lower body. At the lowest point sharply push the body up and try to clap your hands under the breast. Land on your fists. Slightly bend your arms upon landing, so as not to injure the elbows. It is important to develop wrist strength. To do this you have to work with a barbell with a thick neck. Simply keep this post at freely lowered hands as long as possible. Hold the barbell straight grip, relax your shoulders, look straight ahead. The main burden should lie exactly on the wrists and hands. 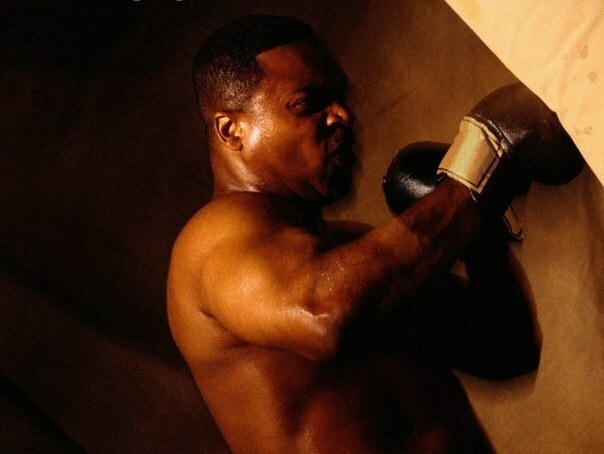 Do the exercise "shadow Boxing" every day at a fast pace for 10-15 minutes. To exercise more efficiently, pick up light dumbbells. Their weight must not exceed 500 grams, otherwise you can easily knock down technique of impact. Hang on the wall or a stable support pillow or a sandbag. Try to strike a quick and sharp blows. One set of 60-70 frequent strikes. Every day do at least 10 sets. For each shot, allot no more than three seconds. First, practice with a stopwatch to catch the rhythm of the beats. One of the fastest fighters jet Li the most important training for his explosive reaction called daily sessions of badminton. Do not neglect you this wonderful game. You will not only develop great response, but also improve your eye and master the shock footwork. Work with heavy medicine balls. Strong throws a heavy ball into the wall or floor will help you develop the strength and sharpness of strike. Throw the ball so that it bounced in your hands. Believe me, it is not as easy as it seems. Try to exclude from their practice exercises on the biceps. Pumped biceps enslaves hand at the time of the extension, which prevents the application of a sharp and strong strike. Better turn in your training work with a sledgehammer. Apply strong blows with a metal hammer on an automobile tire, dug into the ground or mounted on a steady support. This exercise is considered the best for the boxers since the 19th century. Whoever were the man – athlete or a mere mortal he could have literally "hold the blow" of the enemy. Often, this skill is a necessity of survival in our difficult conditions. There are some simple techniques that will help you to do this most effectively. If you train in any section of martial arts or just doing for yourself, then you know that the first important condition is the fight – hold the shotand the enemy. It is difficult to say which is harder – to attack or to defend. But, the key to success in battle is a strong psychological setting and prediction of enemy action. Once learning to control the strike and to direct actions against itself, is incredibly powerful in any match. So how can you learn to curb his onslaught? Will investigate this more.1. In order to properly learn how to hold a shot, you need to initially look into the eyes of his opponent. At this moment pierced most people. One conclusion: they are not psychologically prepared to meet face to face with danger. So on this point you need to work on special techniques, namely: daily meditations for 20-30 minutes.If you learn to see the eyes of the enemy, then surely foresee his plan. That is where will kickyou. In this case, you will be able to react to it more efficiently. 2. As soon as he makes a swing of the arm or leg, take some action for its disposal, namely: get off the line of attack, taking a step with his foot and then finish him off by hand or foot. Put the block on the arm and counter-movement put him a shot in an open area. You can also go defensive, namely, arranging their hands so that they completely covered his head and half torso. 3. Another point about which we should not forget in combat – a counter-movement to the enemy. One of the most productive ways – a direct kick her in the abdomen. It is acceptable to do if the enemy be at a certain distance from you. In this case, you act first and stop him before the shot. According to the coaches of the Russian school of SAMBO is one of the best ways to protect in this situation. 4. Also, don't forget about personal training. Learn to make and keep the shockyou will help you daily even a small exercise for stuffing the limbs (arms, legs), pushups on the fists from the floor, running in the morning, training in the gym and gain psychological stability. Without it, all the exercises go in vain. So, doing the above tips and instructions, you will learn how to quickly restrain the strokes of the enemy. On your physical condition and psychological preparation. Exercise under the guidance of a mentor or experienced trainer. Important: try not to get injured in training. 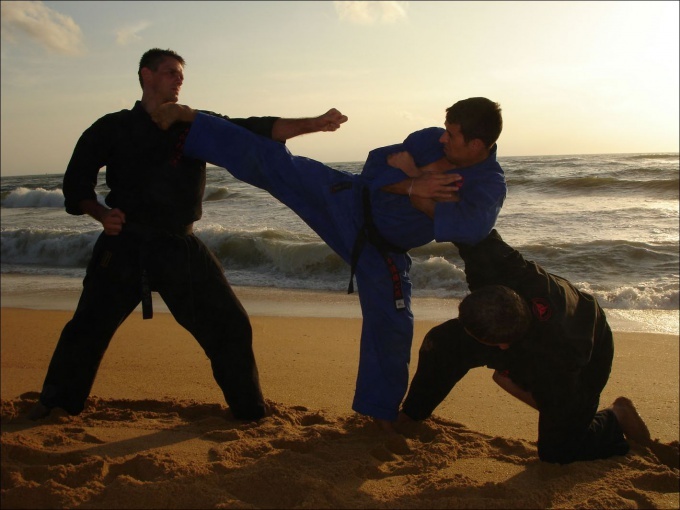 The formulation of the basic techniques in martial arts – the key to natural movements in a real fight. To work out beats with their feet, expensive equipment is not required. You will only need your desire and willpower. To do at home preferably in a special or old worn shoes. When working out bumps legs you can use the usual sports equipment or to make do with improvised materials and objects. So, instead of "pears"? you can use an ordinary plastic bag stuffed with rags, and a barrier that will help to improve the accuracy of the strike will serve as chair. Empty package can be used when developing complex attacks. Toss the package into the air and using different strokes let him drop, beating him, but so that he did not touch the ground. By the way, you can practice techniques impacts not only feet, but hands. - after the strike you need to first slightly bend the leg at the knee and only then lower it. Do the same exercise and have "the wall". In addition, classes in "Swedish walls" will form you and an additional skill – the ability to vary the levels of strikes. Follow a few bumps in the space between the different bars of the projectile at various speeds. If you find this still difficult, do this exercise first in slow motion and then gradually increase the speed of execution. Impact height can also be increased gradually, depending on your level of fitness. Near "the wall" you can practice and circular strikes. Some stand on the side of the wall and the same from level to level? practice the technique of circular bumps, including the bottom. - you can alternate the exercises on the driving range only with high-speed exercises, not power.